The allocation tool can be accessed via your farms dashboard. 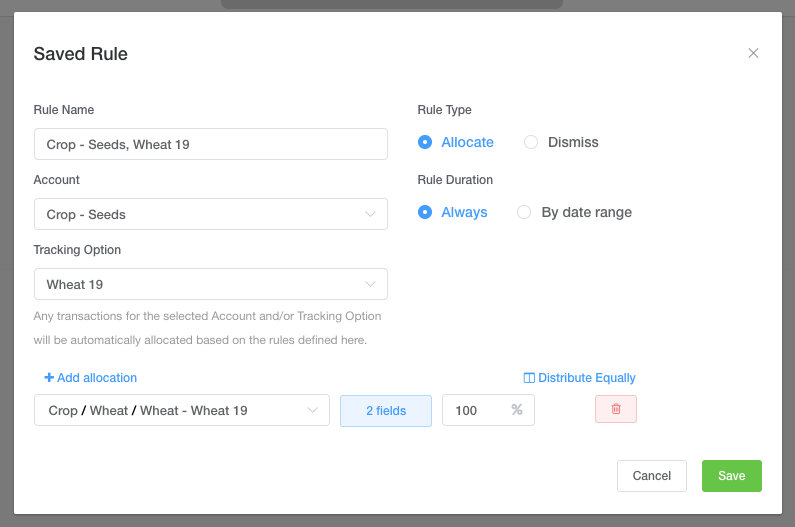 Because all of your Xero expenses will come through to your allocation tool, we recommend setting up some rules which will mean certain transactions will be automatically allocated somewhere or dismissed entirely. On the screen that follows, you'll be able to view existing rules and setup existing rules. To add a new rule, select Add rule. You'll fill in this information based on what expenses you wish to be dealt with automatically. Rules need a Xero expense account and a Xero tracking option (such as Crop Type 2019). That means that any transactions that match that criteria will then be automatically allocated to my crop type -> Wheat 19. There is no limit to the rules that you can create, and these edited and deleted at any stage.